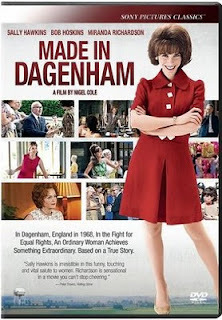 Yesterday marked the release of the DVD of the film Made in Dagenham starring Sally Hawkins. This film tells the true story of Rita O'Grady, who fought for equal pay and helped to shake up the male-dominated workplace in 1960s England. Synopsis: From the director of Calendar Girls comes this extraordinary story based on true events. Dagenham, England 1968. At the town’s local Ford automobile plant, Rita O’Grady (Golden Globe® winner Sally Hawkins) is one of only 187 women in a workforce of 55,000 men. Facing overwhelming opposition in this “man’s world,” Rita rallies her female co-workers to fight for equal pay — a stand that defies the corporate status quo, threatens her marriage, and ultimately exacts a tragic toll. But with the support of the shop’s steward (Golden Globe® winner Bob Hoskins) and the government’s Employment Secretary (two-time Golden Globe® winner Miranda Richardson), the women become the sensation of the nation — and the catalyst for a profound turning point in time. With stars such as Sally Hawkins, Bob Hoskins and Miranda Richardson, this is sure to be an enjoyable and uplifting visit to the past. I'm sure after watching it, it will be amazing to think "it wasn't so long ago that women had to fight for their rights." While current statistics and the recent Wal-Mart discrimination case prove that there is still work to be done, this look at a pioneering woman who bravely fought for equality in the workplace provides lessons for us all.